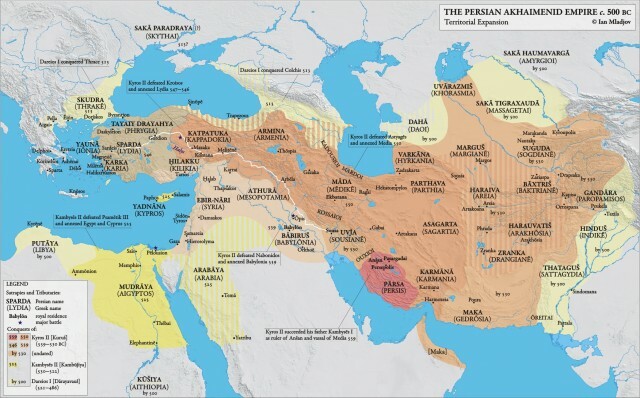 THE PERSIAN EMPIRE was one of the first of the world empires to emerge in the ancient Middle East, the first to unify several different peoples and cultures into one large heterogeneous state. Much of this work was achieved by the emperors Cyrus and Darius, who recognized the strength of diversity, picking the best of a variety of practices and customs and welding them into a system that worked best for the empire as a whole. The original Persian Empire endured only two centuries, but it set a standard to be emulated by successive large multinational states set up by the Greeks and the Romans for centuries to come. The name Persia comes from a specific province within the empire, in what is today southwestern IRAN. Here, in Pars (or Fars), the people spoke a language related to other peoples in INDIA and Europe, but different from the Semitic peoples of Mesopotamia to the west. The Persian tribes (or Parsis) lived in the hilly region between the great empires of the Medes to the east and the Babylonians to the west and were ruled by each of them at various times. Parsis were descended from tribes known as Aryans, which eventually gave its name to modern Iran. In about 559 B.C.E., a Persian leader, Cyrus, unified the tribes, and led a revolution that overthrew the Medes and took over all of their territory (most of modern-day Iran). Cyrus the Great (559–530) established the first major Persian dynasty, the Achaemenid Dynasty, and took the title shah, or king. Instead of oppressing their former rulers, the Persian rulers united the Parsis and the Medes into one people, incorporating the Medes’s strong central government rather than trying to re-create it from scratch. By 539, the combined armies of Persians and Medes had conquered not only neighboring Babylon, but parts of Asia Minor (Anatolia) and Central Asia as well. The empire continued to expand under Cyrus the Great’s son, Cambyses (530–522 B.C.E. ), who conquered Egypt, and his distant cousin, Darius I (522–486), who led his armies as far as the Indus valley in the east and GREECE in the west. Darius was stopped by the Greeks famously after the Battle of Marathon in 490, but his legacy is concerned more with the brilliance of his skills as an administrator of an empire. He organized the empire into a series of regional governments, or satrapies, ruled by men loyal to the emperor alone, responsible for collecting taxes and organizing local militias. Darius also created public works—irrigation, canals, and public buildings—and built good roads for the improved communication and trade between parts of the empire. He created one single currency and a postal system, and standardized weights and measurements to be used throughout the empire. Darius also built a new capital, on plans laid down by his predecessor, Cyrus, at PERSEPOLIS, one of the largest collections of palaces and buildings the world had ever seen. Persia at this time became a center for learning, collecting, and synthesizing the technological and intellectual advances of its many subject peoples, including mathematics from India, irrigation from Mesopotamia, and ship-building from the Greeks. Amidst this cultural flowering, a distinctively Persian religion emerged, one of the first world religions centered on one god instead of many. The teachings of the religious prophet Zoroaster (c. 628–551 B.C.E.) focused on the two fundamental aspects of a supreme being, the aspect of light, truth, health and goodness (Ahura Mazda) and the aspect of darkness, sickness and evil (Ahriman), which eternally strove together for dominance in the universe. Unlike the religions of Babylon and EGYPT, Zoroastrian leaders, known as Magi, taught that there was life after death (for everyone, not just kings) and provided hope for the ultimate victory of Ahura Mazda. The Achaemenid Persian Empire was the largest and most powerful empire the world had thus far seen, affecting nearly every Eurasian civilization except CHINA. Its greatest impact was in the sharing of intellectual and technological advances from societies as geographically far apart as Egypt and the Indus Valley. But ultimately the size of the empire was too much for one single ruler to handle. The son of Darius the Great, Xerxes, renewed his father’s attempts to subdue the Greeks and was again pushed back at Salamis in 480 B.C.E. His defeat in the west encouraged rebellions among the tribes of the east. Political weakness grew through internal and dynastic struggles, inviting Greek armies led by the young King of Macedonia, Alexander the Great, to invade in 334 B.C.E. Within only eight years, Alexander brought the mightiest world empire to its knees and had incorporated it into a new, Hellenic (or Greek) empire. The last emperor, Darius III, was defeated at Gaugemela and killed in 331, and his capital at Persepolis was burned to the ground. For the next three centuries, the main language of imperial rule and culture would be Greek, but the empires of Alexander and his successors did learn a great deal from the Persians about respecting the individuality of their subject peoples, and incorporating and adapting their diverse cultures to benefit the whole. This practice was in turn adopted by the Romans after the first century, and again by the Islamic caliphates established over much of the same area in the 6th century C.E. The territories of the ancient Persian Empire went through many successive rebirths, as the empires of the Parthians, Sassanians, and Safavids rose and fell. The last imperial dynasties, the Qajars and Pahlavis, witnessed the final decay of the Persian Empire across the 19th and 20th centuries, controlled by European and American powers until the Islamic Revolution of 1979 established the theocratic state of Iran.